Ships 7 bus days after proof approval. Silkscreen imprint area is 5" W x 8" H. Deboss imprint area is 4" x 3". 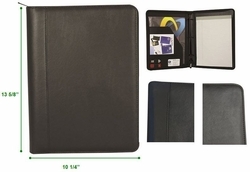 Price includes a one-color silkscreened imprint on cover. 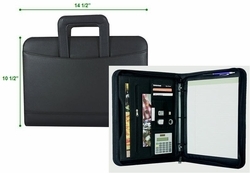 Debossing also available for an additional charge. 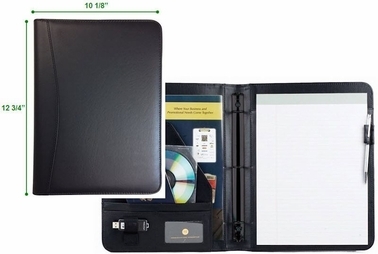 A one-half inch 3-ring binder is built inside this black premium simulated leather padfolio. 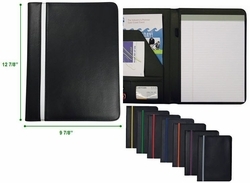 Other features include a stitched padded cover, 8.5" by 11" writing pad, 2 business card holders, 2 USB flash drive holders, 2 file pockets, and a pen slot. 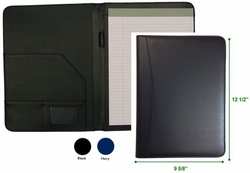 We can custom imprint your logo and message on the cover using either a silkscreen or blind deboss method. 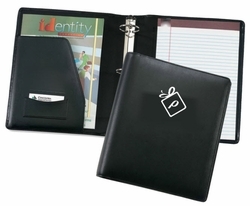 An ideal gift for organizing the hand-outs for your next project kick-off meeting or client presentation.